I never thought I would like meatballs with lemon in them, but over the years I kept seeing recipes putting lemon in meatballs, so I thought I would give it a try. 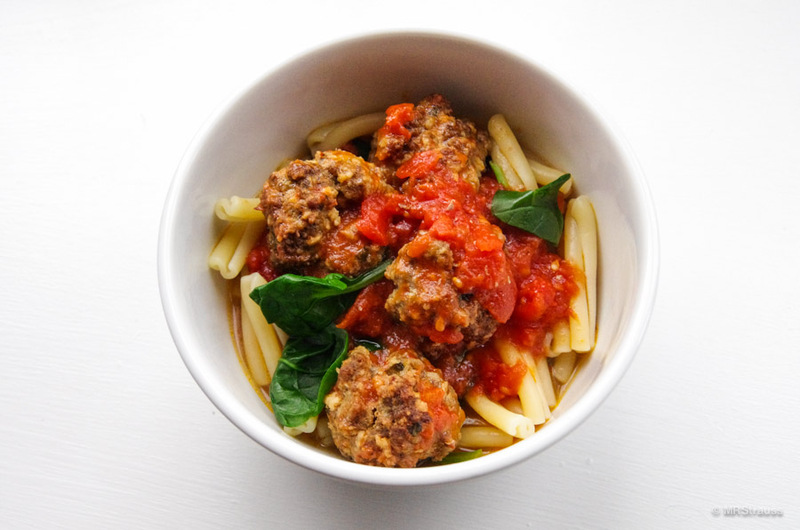 Now I hardly ever make any of my four standard meatball recipes— recipes that took many moons to perfect. The lemon also goes really well with spinach and probably other greens too. I’ve been alternating between two sauces: one is Marcella Hazan’s classic with the onion and butter— which I won’t put here since it’s easy to look up— and the other is a kind of basic sauce with a little wine kick. These meatballs are all beef, but you can make them with a combination of beef, veal, and pork, or you can make them with ground chicken or turkey. I’m using 90% organic grass-fed beef because I think it has the most tender texture and a really clean beef flavor. I also usually make this with gemelli pasta but I could only find strozzapreti. Really any pasta could work here. Put a rack in the upper third and get the oven going at 400º. Line your sheet pan with parchment or foil if needed. I like this recipe best when I make a panade of a large slice of crusty Tuscan or Italian bread in milk. If you want to do this, you need to get this going first. In a small bowl, break the bread into small pieces and add about a half cup of milk and then use a fork to kind of smush the bread and milk together; you’ll need to keep coming back and smushing it while you work on the other stuff. You may need to add more milk. If you don’t want to use bread, you can use a half cup of panko or bread crumbs or even eight smashed-up saltines. You can soak these in milk or just add to the rest of the mix. In a large bowl, beat up one egg. To this you add around a tablespoon of lemon zest, around a tablespoon of lemon juice, a teaspoon of crushed rosemary, finely chopped or pressed garlic (I ran four cloves through the garlic press last time I made this so you may want to start with one), and around a teaspoon of salt and a few grinds of pepper. Now add the bread mixture or crumbs and the meat and mix everything together. I usually have the baking sheet next to the bowl. Now you can make the meatballs. I have been making them a medium size, around two inches. Once you have them done put them in the oven. They’ll take around twenty, twenty-five, maybe thirty minutes to get nice and brown. Set your bowls on the stove to warm. Next up is the sauce. As I mentioned before, I’ve been alternating between Marcella Hazan’s classic sauce and this basic one. In a large saute pan (you’ll need room to put the meatballs in later) add a few tablespoons of good-tasting olive oil and get that warming while you finely chop a small yellow onion or half of a large one and add to the oil. Turn the heat up to kind of sizzle but not brown the onions. Add a teaspoon of salt. Finely chop or put through the press however many cloves of garlic you want (I used four again). Add the garlic to the onions and saute until the onions are sort of translucent. Now deglaze the pan with a half cup of red wine and let it reduce to about half. Now add one 28oz can of crushed tomatoes. Bring to a boil and then reduce to a simmer. You can taste it now and see if it needs more salt or some pepper. If you think you want more sauce, you can add a 14.5oz can of tomato sauce. Let this kind of simmer/bubble. When the meatballs are done, add them to the sauce. There’s a little bit of a lag here depending on how you want to do this. I like to let the sauce simmer for another fifteen, twenty minutes after I put the meatballs in, so I usually don’t start the pasta water until the meatballs go in the sauce. I use the time to clean up the prep area or go through the mail, whatever. So depending on your timing— gemelli takes about 12-13 minutes— get your pasta water started, salting it if you want, and get out the colander. Also get the spinach out— I use an 8oz container of fresh baby spinach. You could try kale or Swiss chard; they may need an extra minute. When the pasta is three minutes from finished, add the spinach, mixing it with the pasta as it wilts. You could probably add the spinach to the sauce— and I may try that— my worry was it would make the sauce taste bitter. Once the pasta and spinach are drained, it’s ready. You can top with some Parmesan or Romano or both. A friend mentioned maybe goat cheese or feta. I’ll have to warm up to that idea a little bit. I guess fresh basil too— that wouldn’t clash with the spinach, would it? I’ve been garnishing it with a few fresh spinach leaves. For olive oil, I use Columela or Nunez de Prado— it has a sort of spicy flavor and for pepper, I use the Tellicherry variety. I also use grass-fed organic beef all the time now— the flavor, and especially the texture, are better I think. This entry was posted in Bentosh and tagged gemelli, lemon, Marcella Hazan, polpetta, spinach on January 31, 2016 by mrstrauss.